Finnair is one of the most innovative, safest and longest-operating airlines in the world. With a complex route network connecting Asia, North America and the northern regions of Europe and beyond through its hub at Helsinki Airport, and a total of 60,000 monthly contacts, Finnair was looking to improve the efficiency of its customer service team, and increase focus on their online sales channel. 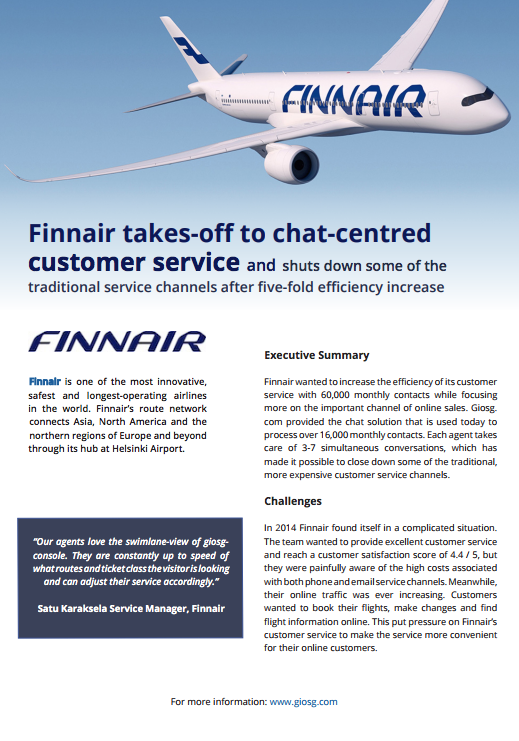 Find out how we helped Finnair prime their live chat for take-off and permanently transcended the limits of their legacy systems in the process.